The Old Morton House, so called, has long been, and is now the object of considerable curiosity and speculation with those given to retrospective reflection. A few remarks, therefore, relative to its general history, and some who have connected with it, may be appropriate, as accompanying the beautiful poem on the same subject found in another column, written by a grandson of the late Dr. Joseph Clark; himself being the seventh generation from the original founder. As to the precise date of its erection, there is no record, at least no traditional one in the family. Its original founder's name was John. He arrived in Plymouth from England, in 1623, when about [6-7] years of age according to family tradition, accompanied by his father George, (a brother to the wife of the much honored Gov. Bradford, who died in Plymouth, June, 1624) and his brother Nathaniel, afterwards Secretary of the Court for the Jurisdiction of New Plymouth. John came to Middleboro about the year 1650, with his wife Lettice, and became the ancestor of most of the Mortons. He died in 1673. The first house erected by him was situated on an elevated spot of land now owned by Mr. Joseph Clark, in front of his present residence near the Nemasket River. This house was burned by the Indians soon after its completion, during his absence from town, or rather about the time of his return; for when he arrived at the top of what is called Rocky Hill, he saw for the last time his dwelling wrapped in general conflagration. The ruins laid buried in a mound till 4 or 5 years, when, an excavation being made the fire-place, ashes and nails were found, to which allusion has heretofore been made in the Gazette. It may be of interest to remark in connection with this, that the land has never been deeded away, the present owner holding it by lineal inheritance; being the sixth generation from the original proprietor. 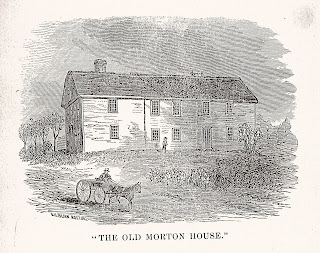 Immediately after the destruction of this house, was commenced what is now called the Old Morton House. The first part erected consisted simply of one room, with a sharp roof, and port-holes, for protection against the Indians. This was considered by the Pilgrims as a sort of half-way house from Plymouth to Newport; the road leading from the Nemasket River by the house, passing the residence of the late Gen. Ephraim Ward, directly over where the well near the house is now situated. - This circuitous route was taken to avoid the powerful Indian tribes around the ponds. The next addition he made afforded another room, now forming the most southerly portion of the house. This was the completion of the old house, as established by its founder. The next addition now called the middle part, was made by John Morton, Jr., who died in 1717, aged 68 years. The last part, extending near the road, was built by his son Ebenezer, not long previous to his father's death. He was the husband of the celebrated Madam Morton, a very active and efficient member of the First Congregational Church, now, under the pastoral charge of Rev. Dr. Putnam. The next in succession was his son John. Then followed his son John, the last proprietor in the Morton name. He deceased Dec. 8, 1833, aged 68; the same age of his progenitor, John, Jr., above mentioned. It may be remarked that contemporary with him, the new part, so called, was occupied by Mrs. Phebe Oliver, who was also a descendant of the same family. This lady married Andrew Oliver, son of Judge Peter Oliver, Chief Justice of the colony, under King George III. By him she had two children, Daniel and Elizabeth. The former married an English lady in Calcutta, and dying on his return, was buried on the Isle de France. The latter married Dr. Benjamin Waterhouse, a distinguished writer, and Professor of Medicine in Harvard University. Mrs. Oliver losing her husband soon after her marriage, and Judge Oliver being obliged to return to England in consequence of the Revolution, and his property being confiscated, she made the old house her home by a legitimate right, which she inherited by her connection with the Morton family. During the early part of her residence here, about half of her time was spent in Boston, in the families of Governors Bowdoin and Winthrop, and Lady Temple; mother of Sir John Temple, and daughter of Gov. Bowdoin. It is said that Mrs. Oliver possessed to a remarkable degree that admirable trait, ever a concomitant of true greatness - an equal recognition of all classes of society. Though accustomed to move in the most polished society of America, and conversant with the most illustrious characters of that time, as well as many of the nobility of England and France, yet no individual possessing any degree of moral worth, however obscure their social position, was prohibited her hospitality or the cordial grasp of her friendly hand. This venerable lady died in 1831, at the age of 84. The Old Morton House is now occupied by the sixth and seventh generations of the Morton family. This we suppose to be the oldest house in Plymouth County. According to the tradition in the family, John Morton, the son of George, early came to Nemasket, and built a house about half a mile south of the present house. This was accidentally burnt while the family were at meeting on Sunday. John Morton then, some years before Philip's war, built the southeast part of the present house, additions to which were made at different times by his descendants. This tradition is confirmed by the fact that Mr. Daniel Alden, a man whose veracity and accuracy of recollection no one can doubt, a descendant of John Alden [of Middleboro], states that he has often heard him say that the Morton house was built before Philip's war, and was saved on account of some friendly acts done by the Morton family to the Indians. John Alden died in the year 1818, in the one hundred and third year of his age, consequently his recollection must have gone back to a period where the house was comparatively new. If this tradition is correct, inasmuch as the town was deserted two or more years and given up to ravage, it brings to view a remarkable instance of that Indian trait of character which has been often noticed, namely, a disposition to remember and reciprocate acts of kindness long after they were received." 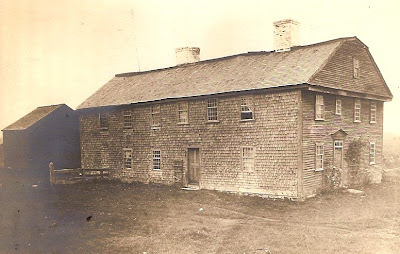 Contrary to Morton's supposition, the Morton House was not the oldest house standing in Plymouth County at the time, others, such as the structure today known as the Richard Sparrow House, pre-dating it. Nonetheless, it may have been the oldest in Middleborough at the time. In its latter years, the Morton House achieved increasing historical notoriety, partially prompted by the approaching Centennial The house was featured in Vice President Levi P. Morton's Memoranda (mentioned above), serving as the ancestral home of the Morton family. 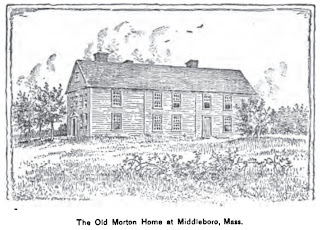 Additionally, an engraving of the house appeared as the frontispiece of the souvenir booklet celebrating Middleborough's own 200th anniversary. Yet, despite the attention and recognition given the building, the house was demolished in 1870. By April, 1870, all but the western portion of the house (destined for relocation to School Street) had been demolished with "fans made from the wood [of the house] ... being hawked about." The remainder was relocated to School Street and fitted into a tenement, possibly on Crossman Avenue. A portion of the ‘Old Morton House’ has been removed to School street to be fitted into a tenement by Alpha Crossman. This one room, a small portion of the Morton House, as it traveled through our streets kindled our mind with a thousand conceptions which we cannot describe; fancy peopled this room with many and strange and aristocratic figures, and in imagination we dwelled upon scenes of daring and romantic adventure through which they passed. Even the lapse of two centuries have failed to obliterate from the local history of this house memories of an illustrious ancestry who have gathered there, many of whom were heroes as well as pilgrims, and it needs but the pen of genius to make their qualities of human greatness and adventure the theme of admiration. Though undated, this photograph of the Morton House likely dates from its final year when it was the subject of much documentary efforts - written, photographic and artistic. 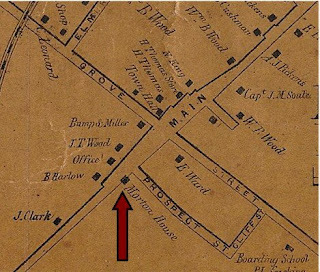 The detail of this map shows the location of the Morton House south of Prospect Street, including its encroachment into a portion of the street itself. It is likely that the structure's position within a portion of the road layout was partially responsible for its demolition, despite its antiquity. The Morton House was depicted in this cut in Stoddard's history of American businessmen of note who included Vanderbilt, Armour, Stanford, Astor and Pullman. 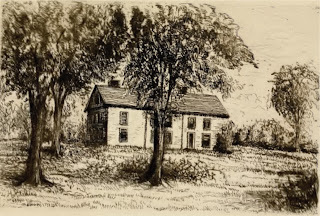 This drawing of the Morton House was completed for inclusion in Morton's autobiographical and genealogical text. While Morton, who served as the 22nd Vice President of the United States (1889-93), had no direct connection with the Morton House, the inclusion of an image of the building in his text exemplified the close familial link between the Morton family and the structure. This engraving appeared as the frontispiece of the souvenir booklet commemorating Middleborough's 200th anniversary. Celebration of the Two-Hundreth Anniversary of the Incorporation of Middleborough, Massachusetts, October 13, 1869. Middleborough, MA: Town of Middleborough, 1870. Ibid., "What the Gazette Was Saying Fifty Years Ago", April 23, 1920, page 3. Ibid., July 20, 1920, page 3. Morton, Levi P. Memoranda Relating to the Ancestry and Family of Hon. Levi Parsons Morton. Cambridge, MA: Printed at the Riverside Press, 1894. Stoddard, William O. Men of Business. New York: Charles Scribner's Sons, 1893.